Over the past few years the Oxford Guild Business Society has accrued a number of glowing testimonials from members, sponsors and the press. Some of these are shown below. Thank you again for organising the Bank of America Merill Lynch event at G&D’s and congratulations on the article that appeared about the Oxford Guild in The Gateway. You’ve clearly put in a ton of work to make the club viable again and to make these events happen. This hasn’t gone unnoticed by those of us who you¹ve helped as a result! Thanks to you and the team for organising the event last night – by all accounts it was really successful. The Oxford Guild Business Society organised a presentation for us to talk to students about the investment management industry. It was a very successful event as we met interesting students from a variety of degree disciplines. We’ve enjoyed working with Abbas and his colleagues, they’ve proven themselves to be enthusiastic and entrepreneurial. The Guild has made a big difference to our recruitment efforts on campus and we really appreciate their hours of hard work they put into assisting us with our events and campaigns. We have been very impressed by the quality of service they have provided. A massive thank you for today – the afternoon tea was the best and most useful event that I have ever gone to at Oxford in two years and kudos for organising such a wonderful event. I found it really insightful and a great way to get a broader view of the many many options available in the city. The Guild's planned events for next term sound excellent I would love to attend as many of those as possible! I just wanted to add how keen I am to join the decision-makers of what appears to be the most dynamic and forward-thinking of Oxford's societies. I was very impressed by both the quality of the firms I visited today and the professionalism of the organisation of the event. I'm not ashamed to admit I'd like to join a winning team, and the Guild appears to be it!! It was a pleasure to speak to the Guild’s members and it is a very impressive institution with a huge amount of professionalism. These students are going to be future stars and leaders at the top of industries. The Guild is most impressive society of all those we work with in the country and we’ve been very impressed with our relationship over last 3 years. It is the society that kept us most up to do date and is the one that has helped us most and for that reason we will be continuing again with our gold sponsorship. 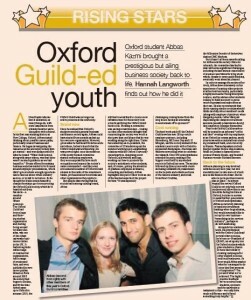 Oxford student Abbas Kazmi brought a prestigious but ailing business society back to life. 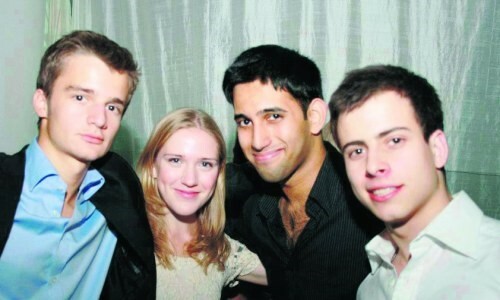 Hannah Langworth finds out how he did it Abbas (second from right) with other members of this year’s Oxford Guild committee Abbas Kazmi tells me that it all started, as many things do, with some inspiration from a family member and a discussion with a friend. In his first year studying history at New College, Oxford, Abbas started thinking about possible career paths, particularly ones in business and finance. He began investigating the resources at the university to help him get started – and was disappointed by what he found: “What I had noticed, along with many others, was that there wasn’t as much guidance as we had hoped for.” Events offered by existing business societies tended to be focused around employer presentations, which didn’t give students enough opportunities to find out about whole industry sectors, or to talk to recruiters. So he thought he’d take action himself to change the status quo by resurrecting the Oxford Guild society, which he’d heard about from his uncle – a member around fifteen years ago. The Oxford Guild had been a large and thriving student organisation and, having being around for many decades, was one of the oldest university business societies in the UK. It had strong links with a range of commercial organisations, held a range of events and fairs, and even published its own career guides. 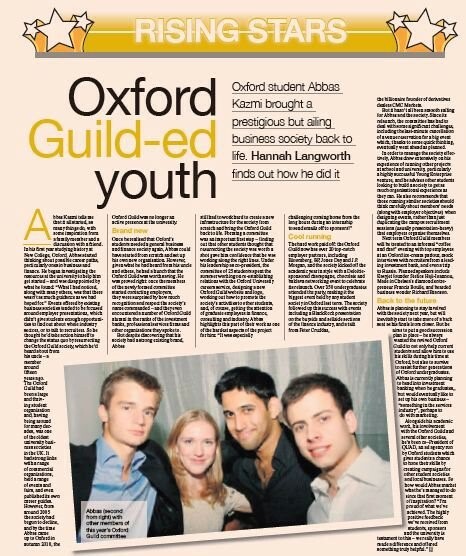 However, from around 2005 the society had begun to decline, and by the time Abbas came up to Oxford in autumn 2010, the Oxford Guild was no longer an active presence at the university. Once he realised that Oxford’s students needed a general business and finance society again, Abbas could have started from scratch and set up his own new organisation. However, given what he had heard from his uncle and others, he had a hunch that the Oxford Guild was worth saving. 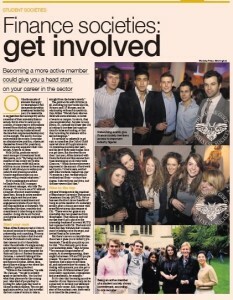 He was proved right: once the members of the newly formed committee started contacting employers, they were surprised by how much recognition and respect the society’s name commanded – and they even encountered a number of Oxford Guild alumni in the ranks of the investment banks, professional services firms and other organisations they spoke to. The hard work paid off: the Oxford Guild now has over 20 top-notch employer partners, including Bloomberg, BP, Jones Day and J.P. Morgan, and the society kicked off the academic year in style with a Deloitte-sponsored champagne, chocolate and baklava networking event to celebrate its relaunch. Over 350 undergraduates attended the party, making it the biggest event held by any student society in Oxford last term. The society followed up this success with events including a BlackRock presentation on the buyside and sellside sections of the finance industry, and a talk from Peter Cruddas, the billionaire founder of derivatives dealers CMC Markets. But it hasn’t all been smooth sailing for Abbas and the society. Since its relaunch, the committee has had to deal with some significant challenges, including the last-minute cancellation of a venue reservation for a big event which, thanks to some quick thinking, eventually went ahead as planned. In order to manage the society effectively, Abbas drew extensively on his experience of running other projects at school and university, particularly a highly successful Young Enterprise venture, and he advises other students looking to build a society to get as much organisational experience as they can. He also recommends that those running similar societies should think carefully about members’ needs (along with employer objectives) when designing events, rather than just duplicating the campus recruitment sessions (usually presentation-heavy) that employers organise themselves. Next term Oxford Guild members will be treated to an informal “coffee and chat” evening with top employers at an Oxford ice-cream parlour, mock interviews with recruiters from a leading investment bank, and even a trip to Russia. Planned speakers include Easyjet founder Stelios Haji-Ioannou, Made in Chelsea’s diamond entrepreneur Francis Boulle, and bearded business wonder Richard Branson. Abbas is planning to stay involved with the society next year, but will inevitably start to take more of a back seat as his finals loom closer. But he aims to put a good succession plan in place – he always wanted the revived Oxford Guild to not only help current students and allow him to use his skills during his time at Oxford, but also to survive to assist further generations of Oxford undergraduates. Abbas is currently planning to head into investment banking when he graduates,, but would eventually like to set up his own business – “something in the services industry”, perhaps to do with marketing. How one Oxford student, disappointed with the lack of career guidance at the university, brought the once-prestigious Oxford Guild back to life MICHAEL YOUNG FRIDAY 08 JUNE 2012 As the UK’s largest and oldest student-run business society, the Oxford Guild has for decades been associated with a range of commercial organisations from investment banks to industrial firms. With the aim of equipping its members with ‘the knowledge, transferrable skills, and networking opportunities needed to develop successful careers in their chosen area of the business world’, the positive praise and accolades the society has received throughout the years,along with the high ranking positions of many of its alumni, is testament to its success. Until 2005 the Guild had its own offices on George Street, a commercial thoroughfare in the centre of the city, where it would host events and first round interviews with a range of global firms. A generous annual budget of hundreds of thousands of pounds enabled the society to throw events such as the main fairs at Oxford and publish its own career guides. In 1996 it almost merged with the illustrious Oxford Union debating society. But at the turn of 2005 things changed: the once-thriving society split into smaller societies and, over the following years, declined until it was no longer an active presence at the university. This continued to be the case for the next five years until 2010 when, in his first year studying history at New College, student Abbas Kazmi decided to address the situation. Along with his peers, he was struck by the lack of career guidance at Oxford. The work done by the existing business societies had stagnated and their events and offerings were not of adequate quality to meet demand. He did not approve of the way they were spending sponsor money on their own committees rather than on services for sponsors and members. Kazmi decided he would take action to change the status quo, wanting to “offer something different”and set about resurrecting the Oxford Guild society, which he’d heard about from his uncle – a member some fifteen years before. He got together a group of keen and motivated students who shared his vision and sought support from the Oxford University Student Union, the Careers Service and the Said Business School. From there, the wheels were set in motion and the Guild’s progress has been rapid beyond imagination. Today, the Guild has a 35-strong committee and more than 15 sponsors and 6,000 members, much more than any other society of its ilk across the country. While the past year has been “hectic but enjoyable” Kazmi is proud of the society’s achievements and attributes its success in part to support from his co-president, Adam Chekroud and vice-presidents, Jacqueline and Sam. The Guild now holds a large number of events and activities for Oxford students ranging from presentations and speaker events to mock interviews, assessment centres, internship opportunities and the chance to compete in managing a virtual online portfolio. Other highlights over the past year have included the champagne socials with Deloitte and Unilever (the biggest events held by any society in Oxford in the Michaelmas and Hilary terms), a huge buyside vs. sellside presentation with BlackRock, a banking afternoon tea for first years with nine investment banks attending, a garden social with BP and talks fromMade in Chelsea star and entrepreneur Francis Boulle and the society’s honorary President, Peter Cruddas, the billionaire founder of CMC Markets. A 60-page careers guide is due to be published in the next month but the most exciting venture on the society’s horizon is the launch of a network for business societies, the National Union of Student Business Societies. The brainchild of Kazmi, the union is made up of one representative from each of the 24 Russell Group universities with the goal of creating a national network founded by student business societies for student business societies. The network will support and represent the societies to help promote careers in the business world. The long-term vision is a thriving network of student-led business societies or groups in every university and college in the country, providing the essential information, advice and inspiration needed for young entrepreneurs within five years. With the economic crisis, Occupy protests and current climate, Kazmi stresses the importance of promoting careers in the business world to young people to show them commercial careers in the right light. Society support will include training, advice and shared best practice sessions, annual society one-day bootcamps, a national mentorship scheme and link-ups with secondary schools. The NUSBS also plans to organise a yearly trip to New York, an annual conference and work together on a termly collaborative magazine. The hard work carried out by the committee has paid off: the society has received glowing testimonials from both students, sponsors and others and helped one large FTSE 100 firm increase it applications from Oxford by more than 20 per cent. Featured as a ‘rising star’ in the Gateway National newspaper the Guild’s brand name and reputation are unrivalled, re-establishing itself as one of the powerhouse societies in the country. Its reputation is based on experience, expertise and in-depth understanding of both the university academic community’s and sponsors’ needs. With this illustrious history and a dedicated and motivated team with strong leadership at the helm, the Oxford Guild can only grow even more. How to deal with an increasingly competitive graduate market? For several years now graduate recruitment statistics have continued to shock and roles are becoming more and more competitive. This has meant that ever increasing numbers of strong candidates are receiving rejections as companies raise the bar. According to a graduate recruitment survey from UK based High Fliers Research, the UK’s leading employers recruited fewer graduates than expected in 2012 and entry-level vacancies decreased by 0.8% compared with recruitment in 2011. The biggest cuts in vacancies in 2012 were at the accounting & professional services firms and the investment banks – employers in these sectors reduced their graduate intake by more than 1,200 places, compared with their original recruitment targets. Students from top universities across the country at being affected and at Oxford University some of them have decided that enough is enough and that things need to change. The Guild’s progress in recent years has been meteoric and they aim to continue to grow rapidly but at the same time maintain their high quality. The Society’s job is not only to hold events for our sponsors but also to act on an advisory basis. As students on campus the committee can help recommend the best courses of action for companies to take and knows what works and what does not. Speaking from the Guild’s HQ, Chairman Abbas Kazmi felt that ‘the key point is that we know this better than anyone else in the country due to the depth of experience we have working with a large range of companies and different industries. This gives us the breadth and depth that nobody else has. You need to run the Society like a company as we are such an enormous institution which does so much good work to help our peers. Our thousands of members are our clients, our sponsors and partners are our shareholders, and our events and services are our product offerings. We hope to continue to provide a stellar and highly professional service to both students and sponsors for many years to come’. With many exciting plans ahead we look forward to the Guild’s continued success. Watch this space. Finbarr Bermingham explains why you should consider becoming a more active member of your university finance or business society this autumn Of the thousands of students that apply for internships or full time positions within investment banks this year, it’s reasonable to suggest that the vast majority will be a member of their university finance society. In order to secure a top position, it’s important to differentiate yourself from the field, which is why recruiters from top banks tell us all the time that simple membership may not be enough. You need to become active within the society. Some take an administrative position, others put themselves forward for presidency, while some may even start their own society. A few do all three. 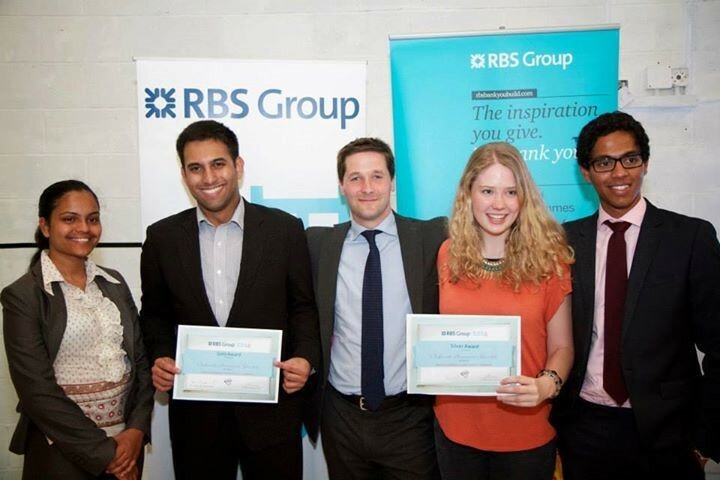 When Abbas Kazmi started at Oxford, he joined societies for banking, entrepreneurship and consulting. He soon came to the conclusion that it would be better if students could pursue their interest in all of these fields under the umbrella of a single society, and decided to resurrect the Oxford Guild society. He’s since founded the National Union of Student Business Societies, a network linking all the Russell Group universities’ business and finance societies. Abbas, then, should know a thing or two about the benefits of getting involved. So it’s clear that becoming an active member of your finance society can be a great way to develop your skills and further your career. And, at the start of the academic year, there really is no time like the present. Meanwhile the Oxford Guild was awarded runner-up for ‘Best Professional Development Programme.’ Commenting to Cherwell, Stratis Limnios, Co-President of the Oxford Guild, stated that, "Our successes are the direct result of the committee’s innovation, initiative and fact that they care the most and work the hardest." Co-President Abbas Kazmi also praised the Guild's Committe's effort, saying, "It has been a truly amazing year and we look forward to continuing our success and work! We look set for another exciting year ahead so watch this space."